This rare prototype could be the only surviving example in the world. Porsche collectors may want to visit RM Sotheby’s upcoming Essen auction next month because a very rare 1994 Porsche 911 prototype will be going under the hammer. It’s believed to be one of the earliest 993 prototypes ever built and is a rare opportunity to own a piece of Porsche's history. Documents indicate it was pulled from the assembly line in 1994 before the engine and transmission were installed and sent to Porsche’s Racing and Technical Development unit at Weissach, Germany, where various components were tested, including experimental wider fender flares and special nose and rear-deck air spoilers. After factory testing, the car was sent to a Porsche dealer in Hofheim where it was sold to its one and only private owner. At the time, the engine had not been announced to the public so both the engine and gearbox had been removed from the car before it left the factory. When the 993-generation 911 Turbo was officially introduced, the engine and gearbox were then refitted into the chassis and body. Despite being used for testing, the 911 Turbo prototype appears to be in immaculate condition. It’s finished in black with a red leather interior and red carpeting and was delivered with Turbo "Twist” alloy wheels, a rear window wiper, air conditioning, electric windows, 12-way electrically adjustable seats, and a Blaupunkt Symphony entertainment system. It isn’t known how many miles are on the clock, though. Most 993 911 Turbo prototypes were destroyed when the car was launched, so this could be the only surviving example in the world. Don’t be surprised, then, if the winning bidder ends up paying between €295,000 and €395,000 ($332,000 – $444,000) according to auction estimates. 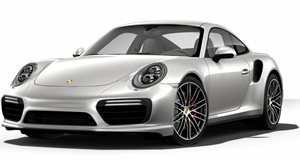 The all-new 911 Turbo is also expected to debut later this year before going on sale in 2020.